Come and explore the 3G pitch, which has a small viewing area, the gym (really a strengthening and conditioning suite), the changing rooms and the lobby. Then make your way through to the newly refurbished clubhouse benefiting from a new heating system and soon new flooring. The indoor pitch will protect users from the wind and rain. However please note it is not a heated space. Remember your base layer in winter! Also please bring with you clean boots, preferably moulded soles or astroturf trainers, to wear on the new pitch. No dirty footwear, blades or metal studs allowed. Please don’t wear them outside – keep them clean and wear them only when inside the new building! The indoor pitch will protect the outdoor pitches from overuse in poor weather conditions. It will also make the training experience much better for all our players, especially our youth players. This project was begun on 7 April and our local contractor, Stewart Homes, completed it on time and on budget! Many members of this club have worked tirelessly giving their free time in lots of ways to get this place built and refurbished. For example, filling in funding applications, arranging fund-raising events and activities, meeting with architects, accountants, builders, etc, using their DIY skills and all working together through the various committees and groups that operate Linlithgow Rugby Football Club. Thank you to all those people that have given so much time. A special thanks to the backroom boys David Mitchell, Gavin Brown and Ken Richardson, who have put a power of work into guiding the plans through from a concept in 2006 to a reality in 2014! However we always need more helpers and if you are interested in any way please send an e-mail to admin@lrfc.club. It’s main use is to support rugby, however we would like it to be used by a wide cross-section of community organisations and individuals. The Micros were the first ones to use the indoor pitch on Sunday 9th November 2014. From the 17th November onwards the indoor pitch will be available for all rugby training sessions. The building has been designed as a stand-alone facility with electronic access 24/7. It has full CCTV coverage and every user will need to go through a full induction before being issued with a key fob. The pitch hours will be restricted to 9am to 10pm, however the gym area will be open for early morning users. We will be publishing the rates on the club website. We need to ensure that we cover our on-going costs and put aside money to maintain and renew the facilities, however we aim to keep charges down to provide access to all. Members will, of course, benefit from preferential rates. Linlithgow Rugby Club facilities are available for hire by: You, Local Primary Schools, Sports Clubs, Community groups etc. £ 65,000 a fantastic contribution from you the members. £30,000 to find this season – this is the final push to finish paying for it. So please dig deep one last time or encourage others to do so! How can I help / what can I do? encourage others to come along. If you’re already doing this, then a big thanks and keep up the good work! If not, please think about helping in these ways or others. Thank you to all those that have given generously. The new Indoor Training Centre started operations on Monday 17 November 2014. This followed a period of final checks, trials and testing after the handover of the new facility on time and on budget from the contractor, Stewart Homes. Where Do I Find Information About Hire of Pitch or Gym Membership? Information will be published on this website. Meanwhile our volunteers have been busy in the existing Clubhouse and we owe a huge vote of thanks in particular to Gordon Jesty, John Smith, Gordon Dixon and Jim Mochrie for the time and work they have put in to the Club. Upgrading of the existing Clubhouse lounge to make our Clubhouse more welcoming for members and guests alike, both in the evening and during the day. Completion of the redecoration of the lounge ceiling and walls, boxing in of pipework and installation of TV on wall mounted bracket for better viewing. New flooring to replace old carpet. Installation of better data projector (donated by Ken Smith) for screening big matches on the new screen at the railway end of the lounge. This was in place for the Scotland v All Blacks match on 15 November. Refurbishment of bar and surrounding area. This will include a new electronic point of sale till system and a new soft drinks mixer unit. Installation of high quality hot drinks machine in Club foyer and drinks and snacks vending machine in entrance area of new Indoor Training Centre. We are introducing new back-office systems to support the major changes that our new facilities will bring. 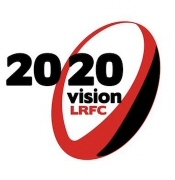 The transition to the new Club website is nearly complete and we will soon be switching it back to its permanent email address (www.lrfc.club). The Club will also be involved in a pilot study with Scottish Rugby on club sustainability covering improved marketing and revenue generation, stronger links to local businesses and joint purchasing trials – more on this later. We can all take pride in what we have achieved. We have reached a significant milestone, however there’s more still to be done. It’s not just about the new facility – it’s about taking the whole Club forward, to make us more sustainable, more welcoming and to maintain our position as a key part of the community. Thanks to everyone who helped out and we look forward to seeing you regularly in the future.